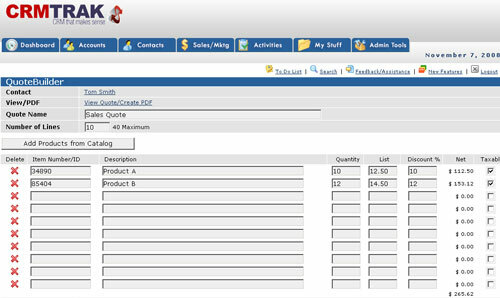 If you create, edit, revise and track sales quotations, CRMTrak makes the process easy. Just create a quote, send your customer a PDF and track the quote through the process. You can edit quotes or create multiple quotes for any contact. You can upload your products and add them to your sales quotes with a single click. No need to re-key product descriptions or prices, just add products to your quotes, save and create a PDF for your customer. Create PDFs of quotations for customers - branded with your logo!